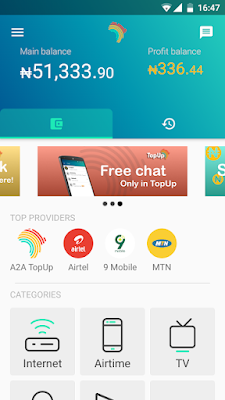 Last year TopUp Africa started with N100 referral bonus for its users, but later reduced it to 70 Naira, from 70 Naira down to 50 Naira and lastly from 50 Naira to just 10 Naira After massive traffic and a huge number of users installed the app. Probably not to be on the losing side because of the huge money they will lose as people keep on earning huge money with their referral bonus service. But today, Am glad to inform you once more that TopUp Africa has now increased the bonus back to a decent amount of 100NGN which was the initial referral bonus. If you aren’t yet using TopUp Africa App, you are missing a lot, others are busy enjoying the amazing goodies and benefiting from the referral bonuses accrued from this app coming as profits for introducing more users to the service. When you refer someone and he/she registers, you get free 100 Naira. The more you refer, the more you tend to get free money. Remember that this referral bonus can be used to buy recharge cards via the top up app, pay for your DStv subscriptions, GOtv, and Startimes subscriptions. You can also use it to pay for electricity bills or to pay for other subscription like Skype (Voucher), Google play store and iTunes app store (Gift cards), Amazon, eBay, Facebook, Xbox, etc. More Interestingly, you can send it (cash out) to your bank account or transfer to your friend’s account. Download TopUp Africa App Here. Follow the on-screen instructions to use it for any transaction you want to make inside the app. You will get cash bonuses whenever you top up your airtime, pay bills, and so on via the app. You will also get bonuses on Every referral up to 100 Naira.